It's time to take your Spaghetti Jollof Rice from basic to exotic! Spaghetti: The quantity you can wrap between your thumb and index finger. Make some Tomato Stew if you do not have any. Break the spaghetti into short pieces. You can break one strand of spaghetti into two or three pieces. Make some coconut milk, you can use tinned one but fresh homemade coconut milk tastes better. Dice the carrots, onions and sweet peppers. Peel, devein and sautee the shrimps till golden. Put the chicken drumsticks in a pot, add some of the diced onions, thyme, seasoning cubes, black pepper and a little salt. Pour in the coconut milk and start cooking. When the chicken is done, remove them and set aside. Add the spaghetti to the coconut milk, stir very well and cook for as long as the time stated on the packet. Add the diced carrots, cook for a bit. Add the green peas, sweet peppers, the remaining diced onions, curry powder and tomato stew. Stir very well till everything is well combined. Cover and once it steams up, add the sauteed shrimps and mix, it's done! The Coconut Spaghetti Jollof is ready to be served. 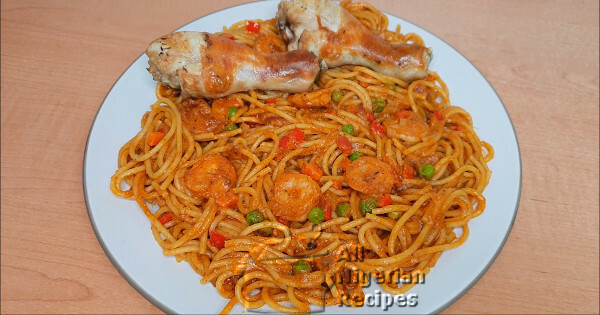 The Coconut Spaghetti Jollof is perfect when eaten alone but feel free to serve it with Fried Plantain. Spaghetti should be cooked with a very big pot. That is to say, the pot should contain the spaghetti and still have plenty of unused volume. Spaghetti should also be cooked in plenty of water. The quantity of water should be at least double the quantity of the spaghetti. To cook spaghetti, first of all, boil water; add a few spoons of vegetable oil to the boiling water and add the spaghetti. Stir the contents very well and cover the pot. With some spaghetti, you need to stir till the water starts to boil again before covering the pot. The large amount of water, the boiling water and the vegetable oil altogether prevent the spaghetti strands from sticking together while cooking.